The end of my South Africa tour, I spent three nights in wine country! Beautiful rolling hills with vineyards, delicious wine and food to taste. A few tour companies advertised biking wine tours, sounded like fun except they were all booked full! So, we rented bikes and made our own wine tour. It was a lot harder than I expected with all those slopes and upward inclines. I can’t even say they were hills but it felt like it. Stopping at several wineries that day, one of my favorite vineyards was the Simonsig Wine Estate. The grounds were beautiful and the wine did not disappoint. They are quite commercial and largely exported. Nonetheless, this was not a set tasting like several other vineyards but a menu that you could pick 5 different wines to sample. The next day we booked a cellar tour at Boschendal Estate. While they do make wine their core business is actually fruit! A quick lunch (with roaming roosters) of a toasted sandwich with chicken salad and fried egg we were off to take the tour including a peek into the saving room. They save out bottles from different years and age these, tasting every so often to find the perfect aged moment before releaseing. Further on the stay in South Africa wine country, we managed to get a table at the widely popular Bread and Wines restaurant at the Môreson vineyard. Accompanied by a bottle of their Mata Mata wine we ordered beer and mustard poached pasture pork hock with spiced corn and sweet cabbage and the Springbok loin with braaied celery with curried parsnip and apple relish. Part of our South Africa tour was a drive from port Elizabeth to Cape Town, stopping in a few of the seaside towns on the way. One of the more impressive meals was found in port Elizabeth in a restaurant called The Colonial Kitchen. I ordered an appetizer as my main because I was so surprised to find the slow roasted bone marrow on the menu that I had to have it. It was delicious! Served with toasted bread and a light tomato flavored sauce. To add to the joy, the restaurant had a very sweet old cat that loved being petted and lazying around on the patio. Further along the journey to Cape Town we stopped in a town called Mossel Bay. We booked a very cute hotel, The Santos Express, which is an old train looking over the beach. My suit was beautiful and felt like I was transported in time. Unfortunately the weather was not on our side. Rain poured down the entire day. We took a little stroll bout found that not too many places of interest were open so we headed back to the hotel and enjoyed a waterblom bredie, a stew type dish traditional to South Africa. Waterbloem is a small water flower found in small ponds only blooming in the warm winter months. The Waterbloem didn’t add to much of an unknown flavor it is more like having a long slow roasted vegetable like courgette or green beans. The stew is typically made with lamb meat and potatoes. Further down the road, our next stop was a little town called Fish Hoek. While searching for a place to sleep for the night and seeing so many cute sea see town pictures we settled on a B&B in Fish Hoek. Little did we know that Fish Hoek did not have the same picturesque vibe that we saw in the surrounding towns like Kalk Bay. Only two restaurants in the town and the one in walking distance was closed. So we caught a cab to Kalk Bay to eat at the Cape to Cuba restaurant. This was a funny place, very bright and colorful with Cuban inspired dishes. The pictures of the food were not notable but this gives you a taste of the decor including a swing. Upon arriving in Cape Town we enjoyed a two day stop and got to explore the city a bit before moving on to the famous South African vineyards. Cape Town has so many restaurants to choose from. We spent some time at the harbor area that looks out over the small fishing boats, you have an enormous tourist mall and lots of harbor side restaurants. Very, very touristy but endless choice. One of the restaurants we stopped at in the city center was called Hemelhuijs. The food was not only beautiful but also delicious. Starting with an orange wine with basil and soda, I ordered the veal with crab butter, parmesan and pine nuts. This did not disappoint, since both veal and crab are very soft flavors one did not overpower the other and was really a very lovely meal. The first couple of days on vacation in South Africa had been a bit chaotic and tightly planned. After arriving in Johannesburg the next morning we caught a new flight to Nelspriut to look at chimpanzees and go on a two day safari. Mostly safaris advertise the big 5: elephants, rhinos, tigers, leopards, and buffalo. Not only are the big five to be found but many other animals like the giraffe and zebra are part of the experience. Some like the giraffes and elephants are in abundance in Krueger park and are very much out in the open but the leopard and tigers are are a bit more elusive. We got lucky in that we saw all big five plus lots of other animals in the first day. Including a very special mating performance by the lions which the tour guides found to be a special occurrence. Part of our safari package was a braai, the traditional South African barbecue. Meet Mark, our safari guide for the day and our braai specialist. While chatting with Mark it became clear that the braai is a very special and important part of their South African culture. Any chance he can get and at least once a week they braai. The type of meat changes but for us it was beef steaks royally seasoned with a light spicy chili and herb powder and continually basted with beer. The beer was just the type he was drinking from at the moment. Typically to accompany the meat is garlic bread grilled in tinfoil on the grill with corn on the cob also grilled, a green salad, potato salad and a mixed brown and green bean salad. The braai felt very familiar to my Americanness. Ending the two day safari we visited the Blyde Canyon and stopped at Harrie’s pancake restaurant. This time feeling rather familiar to my dutchness. I usually eat my pancakes filled with sweet ingredients like fresh fruit or syrup. But at Harrie’s their hearty pancakes really did look good so I ordered a spicy mince and cheddar cheese pancake. I have always wanted to go on vacation with my mother to Greece. As a young woman she visited the beautiful islands and has always spoke fondly of her getaway. But, while looking into vacation options, we decided Greece would have to wait until my sister could join us. For one thing our window for a week away was the wrong time of year, a bit too cool to have relaxed evenings on a terrace and, while you can find a flight to Athens, it is still a 4 – 8 hour boat trip thereafter to any of the more picturesque islands, it just wasn’t in the cards this time around. So that trip will still happen and with a bit of luck and planning maybe we can have my sister and her boys join. With Greece out of the running for a place to visit I searched my own list of places I want to visit. The criteria, not too warm or too cold, not too far of a flight considering we are only going for maximum a week, somewhere beautiful and ‘authentic’ meaning I was not interested in staying for a week at an all inclusive resort where you don’t leave the actual hotel premises. While these can be very relaxing, we were looking for a bit more of an experience than just excellent weather and a beach to hang out on. After a bit of googling we quickly decided on Madeira. Already on my list but within a few minutes even after other suggestions it was decided! The flower island, the always spring time island. 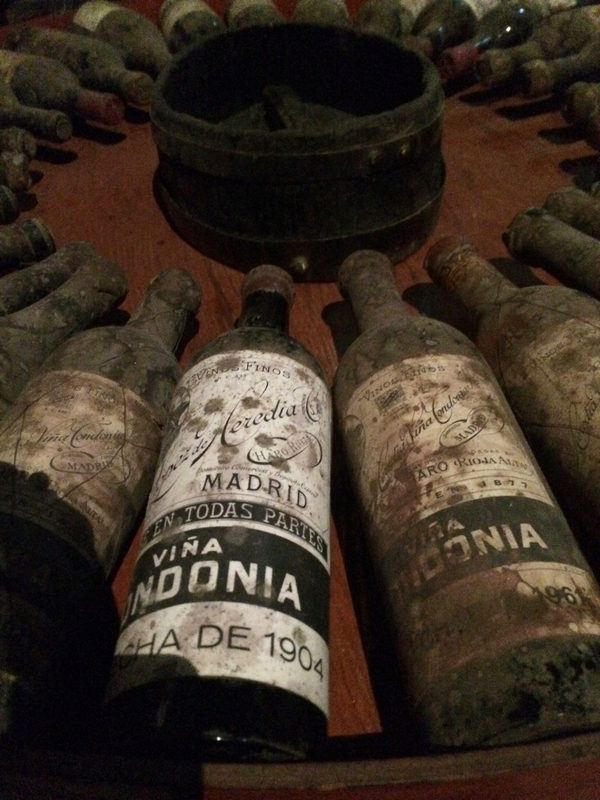 I had heard of Madeira wine before, what I thought then was mostly used for cooking. It is a fortified wine on the sweet spectrum of wines although there is quite a variation in sweetness depending on the grape variety and aging duration. I had also heard of Madeira from a song called ” Have Some Madeira, M’dear” the first time hearing this song was a Dutch cover but a bit of an internet search it turns out it was originally in English by Flanders and Swann and has more famously been covered by the Limeliters. Click here to see a hilarious and rather inappropriate video which makes me laugh any time I watch it. Yes, I think I listened to it 50 times before going to the island of Madeira. On to the trip! Madeira is known for its beautiful flowers and is now known to me for the many, many elderly folk. I personally brought the average age down by a few decades anywhere we went. Which was surprising considering all of the hills to walk up and down. Their main export, aside from Madeira, is bananas. The island is filled with banana and other tropical fruit plantations. Since it is a volcanic island the soil is very fertile and they use terraces to grow pretty much everything. Passionfruit are very well known but in Madeira (honestly I am sure it is not only Madeiran but since I have not seen these fruits anywhere else I can think for now that they are Madeiran) they have banana passionfruit, tomato passionfruit, orange passionfruit and the list goes on. Walking through the tourist market hall you can sample and buy these expensive and odd fruits. Bananas and passion fruits are combined with many or the local specialities like scabbard fish and banana. Other favorites on the island are meat skewers stews. My favorite meal of the trip was quite a walk uphill from our apartment to a restaurant known for their Madieran (less tourist) food. Stews with beans and rice! The most notable part of the food experience was the famed Poncha, the local cocktail. Made with sugar cane rum, lemon juice and honey is the classic. Use passion fruit juice or mint or just granulated sugar instead of honey to change it up a bit. I was recently taken on a surprise weekend away. I didn’t know much ahead of time, in fact the surprise was kept until the gate, the only information I had was that it is about a 2 hour flight and fairly mild summer weather. I boarded the train to North Holland, the super fast intercity that stops in both Schiphol and Amsterdam. Getting out at Schiphol, my travel companion stopped to look at the train times but proceeded to the KLM check-in only to stop half way and pull out an empty duffle bag, meant for me to place my bag in so that it could be checked. We were already checked in for the flight and he already had my boarding pass on his phone, which I could not see. We passed ticket control and up to the KLM lounge for a little over an hour wait. Two glasses of Prosecco later we head for the gate and walk by it twice since boarding hadn’t begun. Finally the suspense was lifted !!!! We are going to Bilboa! As it turns out we take a short hour bus ride from Bilbao to Haro, a tiny town in the heart of Spain’s Rioja wine country. For the next day and a half I spent my time hopping from one wine tasting to the other and spending a bit more money on some wines to take home and share. The town of Haro is a little town that centers around wine. The wineries and bodegas are mostly concentrated in a single neighborhood close to what used to be a train station, a location quite important for the wine trade at the turn of the century. The train station is no longer used but it is still central to many of the vineyards’ histories. The main grapes grown in this region for red wines are Tempranillo and Grenache. 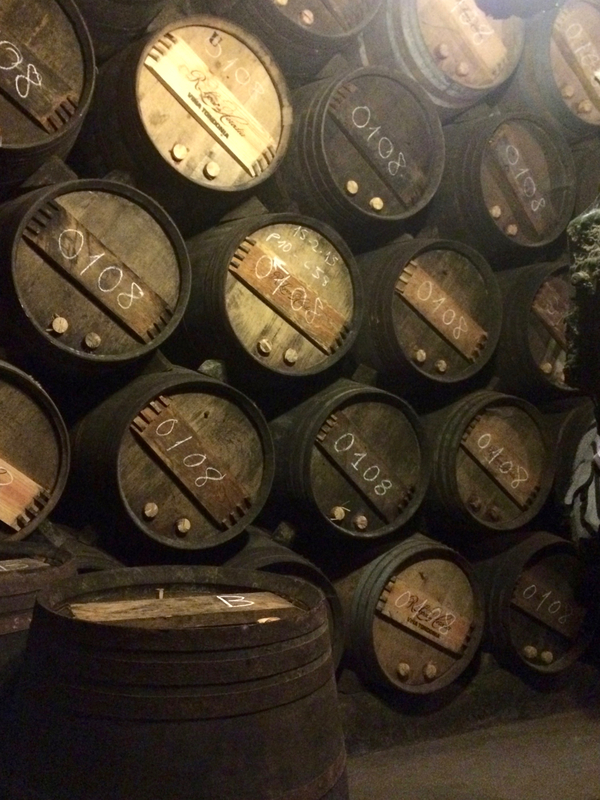 The wine tour we took was at R. Lopez de Heredia Vina Tondonia, the oldest in Haro. They use traditional methods of wine making and aging, allowing the cave to naturally regulate the temperature. We toured caves covered in mold and spiderwebs. They also have an in-house barrel maker which I understand is quite rare as most vineyards order their oak barrels already made. Haro only wakes up around 10 am with a long siesta from 2 until 6 pm and will have a lovely sound of chatter and wineglass clinking until about 1am. The main streets are filled with bars and restaurants. A glass of crianza wine cost around 1,60€ and a pintxo’s about the same. We filled our day time with wine tastings and the evenings with bar and restaurant hopping. 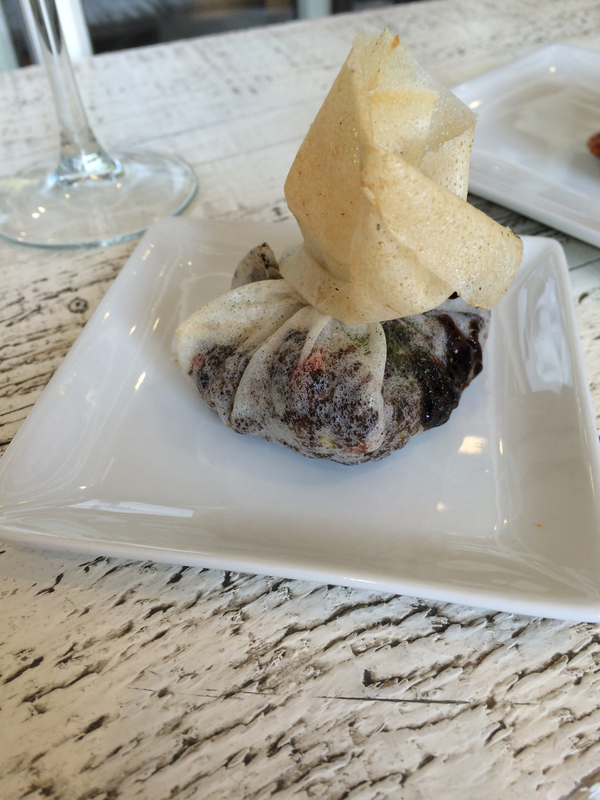 Two of my favorite dishes were a crispy parcel filled with morcilla (blood pudding) typically made using pork blood and rice. 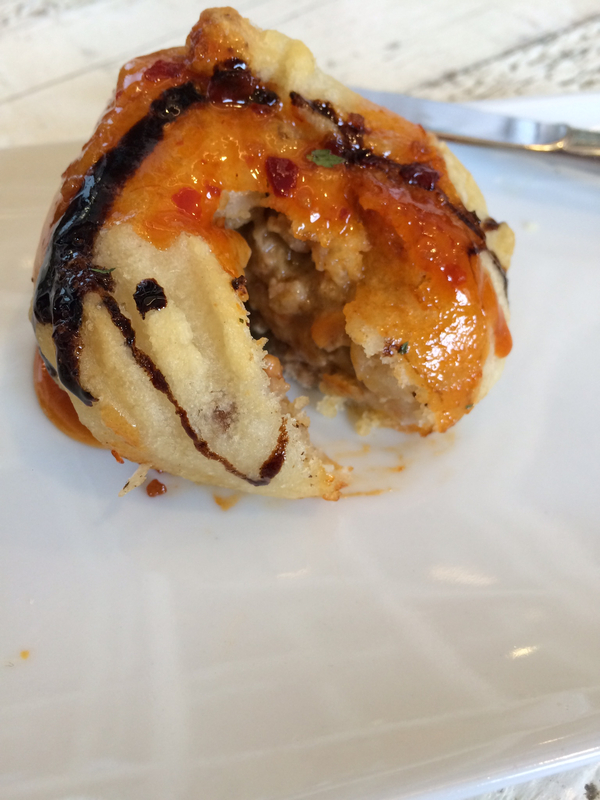 I don’t really know the name of the pintxo below but it came down to a soft bread like pastry filled with meaty goodness and spicy sweet chili sauce. Living in Europe has its perks with many amazing destinations within a small continent. Mini- vacations are relaxing and hectic all wrapped into an amazing 3 or 4 days over a long weekend. I always want to get the most out of a weekend getaway, as many cultural and touristy sights as I can while still taking it easy enough to enjoy the days off from work and natural rhythm of the destination. I am not usually a fan of the major tourist sights but, more often than not, they are historically and culturally significant and warrant a visit. 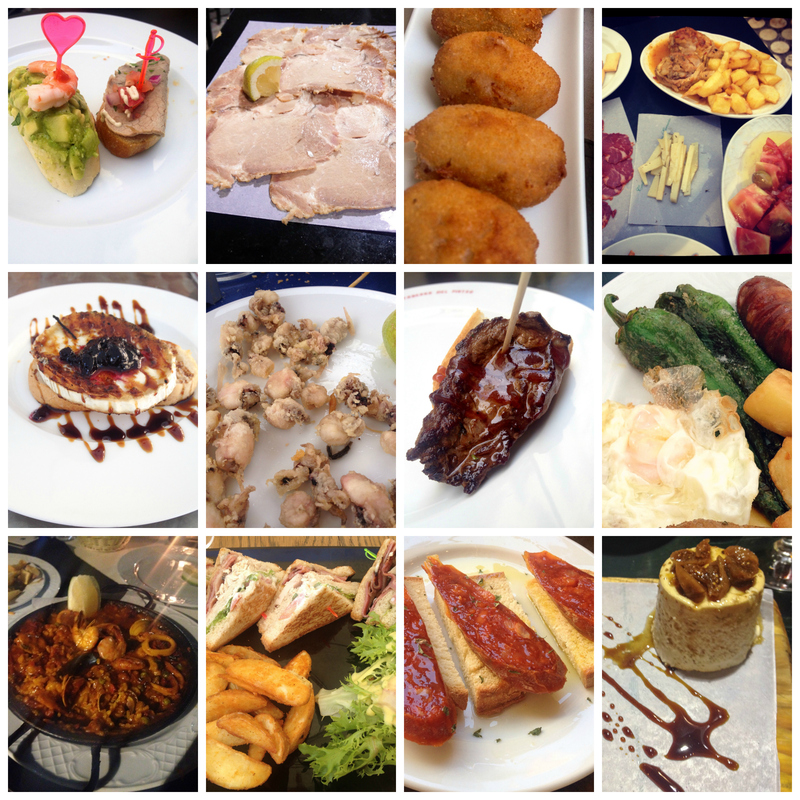 Recently I took one of these mini-vacations in Barcelona. It has so much to offer! Beach, shopping, arts, tourism and of course FOOD. 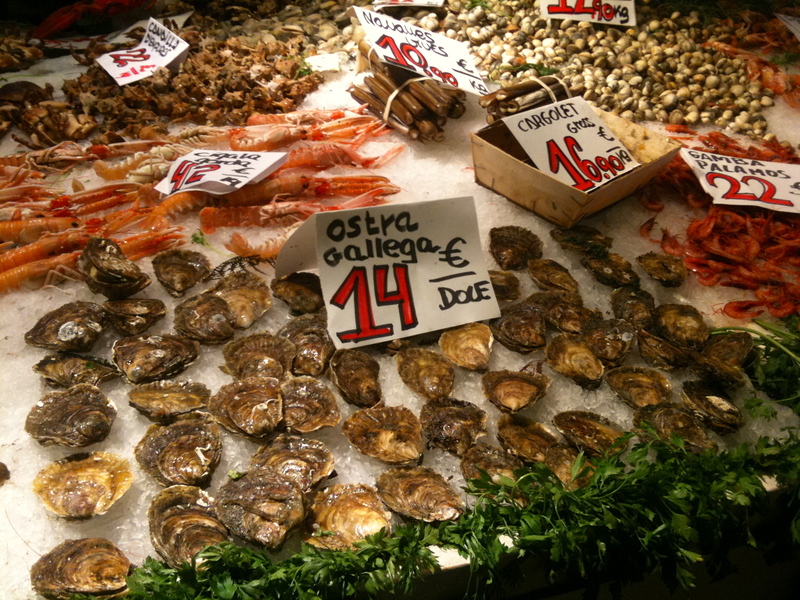 I could spend days in La Boqueria. 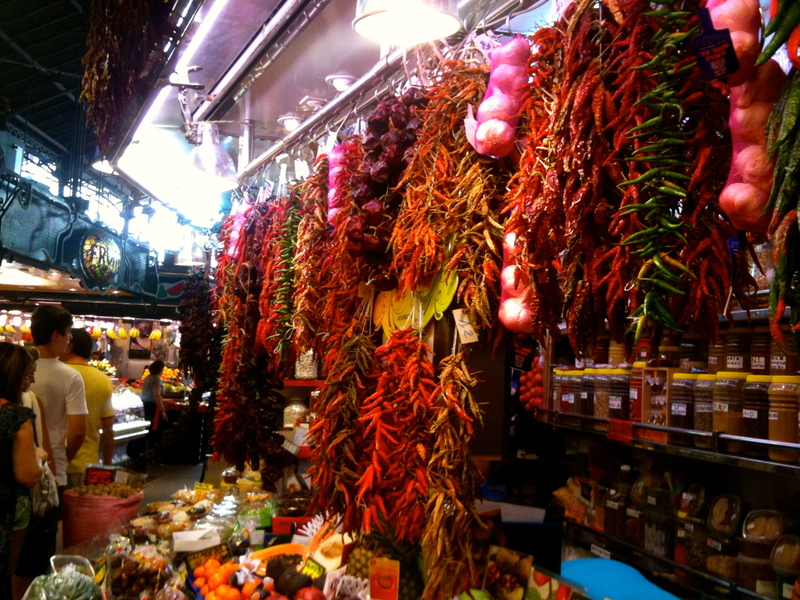 This market is impressive, also probably one of the most accessible and famous as it is right on La Rambla and very hard to miss. Stall after stall of fresh produce, dried chilies, fresh sea food, cured meats and the list goes on. Finding food that I had never seen before is such a treat. 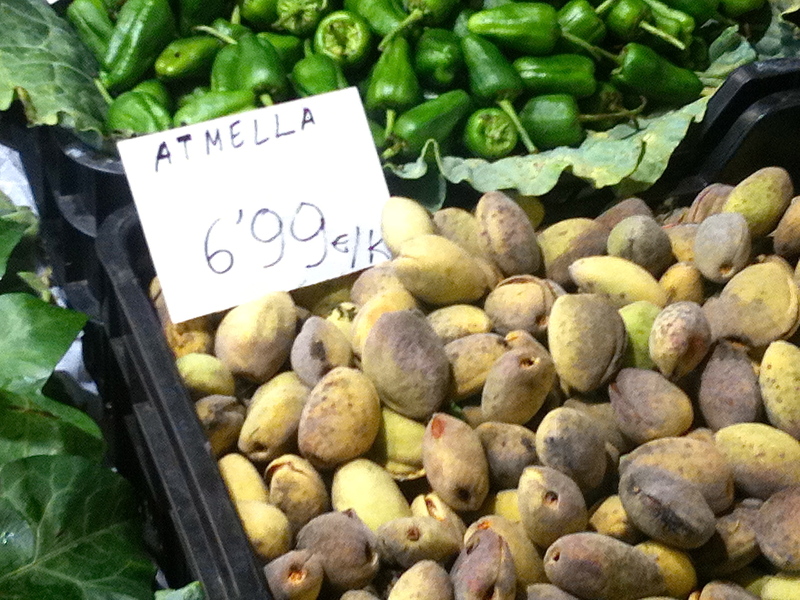 For example, I had never encountered green almonds or almond fruit before. I snapped this picture and promptly googled this once I could find some free wi-fi. If you are looking for some brain or pig feet this is the place to go. (Some of the other items in the picture are unidentifiable to me. I am not brushed up enough pig anatomy). So many intriguing products. A bit of a downside is that I could not take a single thing with me to try at home. Maybe next time I can go for longer and rent an apartment with a kitchen to have a bit of fun! Iceland was never really high on my list of places to visit. It always seemed interesting to me but I am not normally a fan of cold so the name (very bad reason for not wanting to visit somewhere, I know) and the fact that I knew next to nothing of Iceland, just that I fly over it and Greenland each time I travel to and from the US, stopped me from making it a top place to visit on my list. Part of my sisters vacation in Holland last summer was a planned stop over in Reykjavik on her return to the USA. So the chance was also there for me to visit Iceland with her and I took it! Iceland does live up to its name. Summer weather is a cool 15 Celsius degrees with a bitting northern wind which means the extra sweater, light summer jacket and the shawl just wasn’t quite enough to be comfortable. It was still pretty cool to see the geothermal pools, volcanic landscape and beautiful waterfalls! Since Iceland is a volcanic island they do not have the same agricultural opportunities as most countries. They either have to import or grow food in green houses. Meaning food and anything ‘fresh’ is hard to come by or really expensive. They do have an abundance of fish (obviously). Whales used to be on the list of delicacies of Iceland but since tourism has boomed in Iceland the tourist are endangering the whale population and they have some activist groups working with the whale watching tours discouraging tourists from trying whale. There are still plenty of Icelandic foods to try. 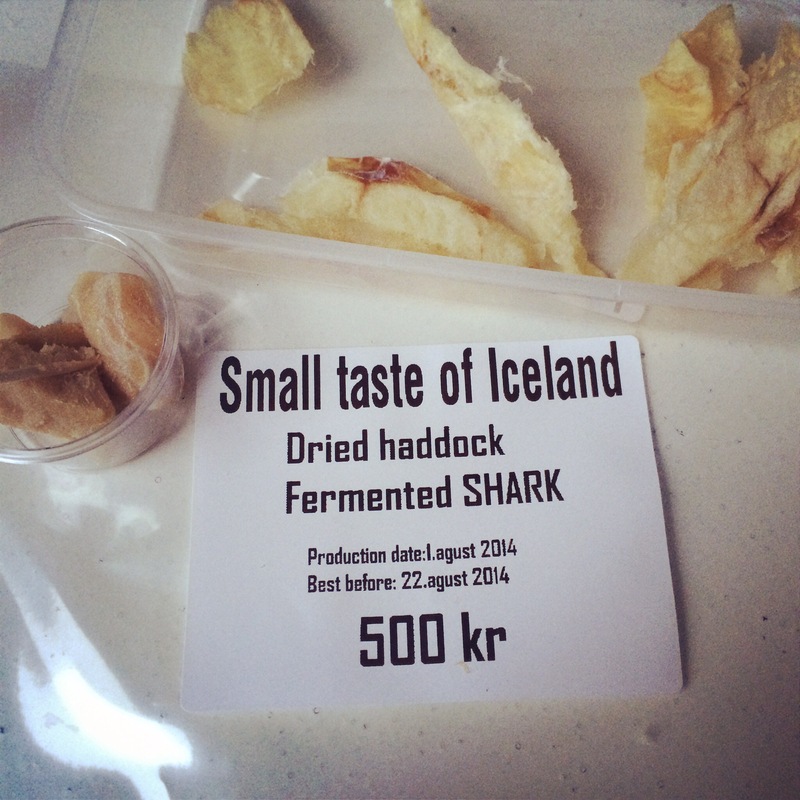 Fermented shark (Hákarl) and dried haddock on the top of the unique foods to attempt try. The died and salted haddock was not bad, required a big gulp of water afterwards but not at all bad. It was just a very salty fish. The shark on the other hand was more of a dare with myself and believing that you should always try something once, so I managed to eat two very very small pieces. I did not at all taste shark or have the slightest fish flavor but ammonia. An incredibly overpowering ammonia taste. BUT I did it and I now know to never to do it again. Thanks to my wonderful sister as she captured the moment. Deciding and booking only two weeks in advance for a 10 day trip to Chile and Easter Island is not how I usually plan a vacation. However, if the opportunity is there might as well take it (thanks to my neighbor for the opportunity)! The first stop of the trip was Santiago, spending 2 days wandering around and taking in as much of Santiago by foot as we could before heading off to Easter Island for 4 days. On our return from Easter Island we took a night bus to the coastal and world heritage site, Valparaiso. We spent a day climbing the hills and riding the pull lifts. From here we took a bus south to the San Antonio valley to enjoy some Chilean wines. The fist afternoon of Santiago was probably the best food day there, beautiful ceviche and beef and cheese empendadas! These were actually more Peruvian influenced than original to Chile, which is what I found a lot in the first days of Chile. It took quite a bit of effort to find something typically Chilean. We ate our way through quite a few Peruvian inspired dishes, only after consulting with a local did we have any idea of what to look for. Like this humita which is typically Chilean and rather tasty even if the picture doesn’t do it justice. It is basically an unfilled tamale. While in Santiago I was introduced to the famous Pisco Sour! Oh My, are these good! Pisco is a brandy, matured in either copper, steel, glass, or wooden vats. To make a Pisco Sour, like many sours, is really quite simple. Add lime juice, simple syrup and ice, don’t forget the Pisco, to a cocktail shaker and shake well. Strain into a champagne glass and you have the typical Chilean Pisco. If you want to mix things up a bit and make a Peruvian Pisco Sour you still need Pisco, lime juice, simple syrup, and ice but now you add an egg white to the shaker and shake away. You get a nice froth to the top of the Pisco Sour, add a few drops of Angustine bitters to the top and it’s ready to drink! Pisco Sours quickly became a favorite drink during the drip. One final tip for Santiago, (and yes go to the big market, wander around all the interesting and beautiful food, smell the delicious soups, and find somewhere to sit down for some lovely seafood) whatever you do, do not order the cocktail de mariscos. While I think this is a joke on the tourists it was truly on the menu and, in the spirit of adventure, a fish cocktail sounded intriguing. It is a cocktail… of salty water and some unidentifiable fish bits. Yes, it tastes as bad as it looks, the camera didn’t even like the cocktail. So incredibly beautiful, Easter Island is one of the most remote inhabited islands of the world. It is a volcanic island with three dormant volcanos. Spending 4 days here was amazing. The only way to get around easily is by car. I saw some tours advertising bike transportation but, after driving around for a while with a car, I was very happy not to have done this with a bike. Easter Island is a surfer’s paradise, apparent to me by the large number of surfers riding the waves each day. I didn’t try this one myself but did enjoy a dip in the Pacific ocean on the one little beach of Easter Island. Easter Island is most famous for the Moai, the stone statues. Since Easter Island is considered part of Chile it is no wonder that there are quite a few food and drink influences. Remember those Pisco Sours? I certainly do. Ending the trip we headed a bit south to the San Antonio Valley. Chile is very well known for their wines, but San Antonio Valley is relatively young with its wine production. Being a bit cooler and closer to the sea these vineyards are faced with more freezing and molding problems that other well known Chilean wine areas. Despite the extra challenges, the wine from this area is delicious. The first wine tour and tasting at Matetic vineyards focused greatly on the biodynamic methods in their wine production. Biodynamic methods are quite interesting, not only do they adhere to organic farming standard but they also incorporate nature and cosmos and holistic farming, like adhering to moon patterns to dictate the planting and harvesting of the grapes. Matetic was a bit of an expensive tourist trap. Beautiful grounds and delicious wine but I felt very out of place as we came by bus and cab and, while never mentioned on their site, from the reception it was still a 40 km drive out to the tasting room and cellars and it was expected that you came by car, oops. Lucky for us the tour for the hotel was not happening yet so their driver was kind enough to act as a guide and take us the extra distance. Since we had not planned ahead we did not have reservations at their restaurant, meaning we picnicked at their wine bodega with meats and cheese and wine bought from their store. A day before arriving in the San Antonio Valley we booked our accommodation at the Casa Marin Villa. This was the best way to end my Chilean trip. Casa Marin is a boutique winery. Not only were the views and villa beautiful, but the wine was absolutely delicious. The owners, both mother and son are wine makers, have created their own signature Pinot Noir wines, hers is deep, with mushroom and earthy flavors while his is fruitier and a bit more acidic. Both fantastic! Located just outside of a very small little town Lo Abarca, we ordered our food at the nearby rib house and it was brought up to the villa by the farmhand. The whole staff was incredibly gracious and welcoming. I don’t know if I will ever be able to outdo the experience of Casa Marin, the kind and down to earth employees, beautiful grounds, and wonderful wine. Not to mention the home made Chilean dinner prepared by sweetest cook. Here is our desert, apricots being the theme with a pana crook type desert accompanies by an apricot mousse and a very sweet apricot liquid with pearl barley. ín el Grande at the lovely Casa de Leila, more on this later. We had beautiful weather and plenty of sights to see, Malaga has a rich history. The city facade shows the Roman and Moorish influences and history, To name a few of the sights: the Picasso museum including a visit to the house Picasso was born in. We hiked up the hill to Alczaba and the Castillo de Gilbrafaro which was so worth it not just because of the cultural significance but also for the beautiful view of Malaga and sparkling blue sea. We also spent a day or two just relaxing and hanging out on the beach. In general I drink only one beer year and the hot sunny beach of Malaga was where I choose to do this. More importantly we also ate so much wonderful food. Sea food grilled right on the beach, glasses of Cava and of course many many pinchos and tapas. 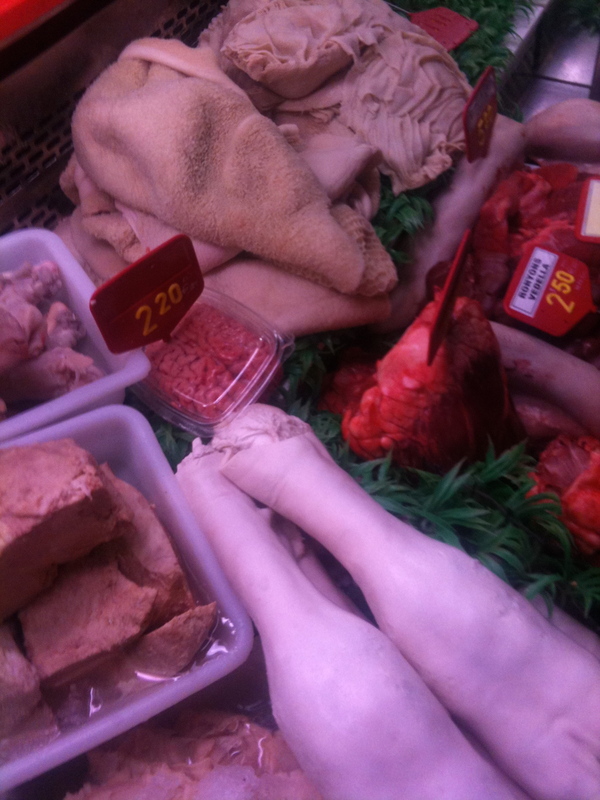 Malaga also has a wonderful indoor fresh food market. These kind of markets are actually my favorite places to visit while on vacation. I always get to see so many unknown (to me) products. Mostly it is the bustle of a market and ogling the interesting products. That was week one of the vacation and it was delicious! The more I start drafting posts for this blog the more excited I get about it and the more I want to share. I have so many things I want to share with you. For now I am trying to get everything up to date so some of these posts happened a year or two ago but since I hadn’t been introduced to the blogging world yet they are only going to be published now.